What Is Marbling in Steak? In the culinary arts, the word marbling refers to white flecks and streaks of fat within the lean sections of meat. Marbling is so named because the streaks of fat resemble a marble pattern. Also called intramuscular fat, marbling adds flavor and is one of the main criteria for judging the quality of cuts of meat. In general, the more marbling it contains, the better a cut of meat is. Note that we're not talking about the layer of fat on the outside of the steak or roast, which can be trimmed away. Nor are we talking about layers of fat between two separate muscles, like you'll see in chuck roasts, for instance. 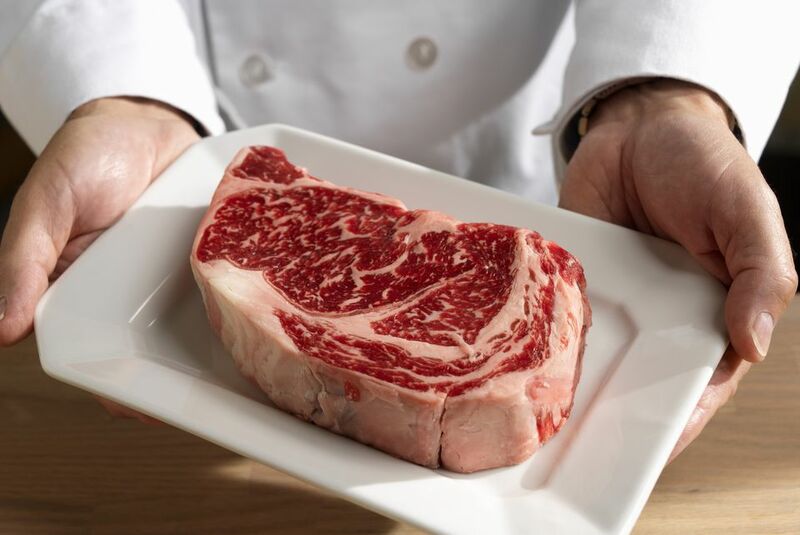 Marbling is strictly the flecks of fat that occur within the meat itself. Marbling is fat, so it is largely determined by the diet of the animal (and to a certain degree the breed of cattle). Cattle that are raised on grain will have more marbling than grass-fed beef. This is fairly intuitive since you can imagine how difficult it would be to get fat by eating grass. It's also why you've probably never seen grass-fed beef that was graded prime (which is the highest grade), despite the fact that grass-fed beef is more expensive. Certain cuts of meat naturally have more marbling than others. The beef rib and short loin are among the most marbled sections, while the beef round and sirloin tend to have the least. Indeed, to ensure an apples-to-apples comparison (or steak-to-steak, if you prefer), inspectors look at the loin muscle, specifically between the 12th and 13th ribs, which is where the short loin primal cut meets its next-door neighbor, the sirloin. Tenderness and marbling don't necessarily go hand in hand, so while the beef tenderloin is possibly the most tender cut of beef, it doesn't usually have much marbling. Hence the practice of wrapping tenderloin steaks with strips of bacon — without it, the steak would lack flavor and moisture. Moreover, quality grading is as subjective and arbitrary as the perceptions of the individual person who performs the inspection. There is no formula for how to ascertain the exact point where a moderate amount of marbling becomes slightly abundant marbling. It all has to do with the inspector's impressions of a single location on the carcass.